Every day, an average of 16 people are hospitalized in Canada due to opioid poisoning. That represents a 70 percent spike in opioid-related hospital admissions across the country over the last decade, according to a new dataset from the Canadian Institute for Health Information released on Thursday. Health Canada also released new numbers that reveal 602 people in Canada died of opioid-related overdoses in the first three months of 2017. 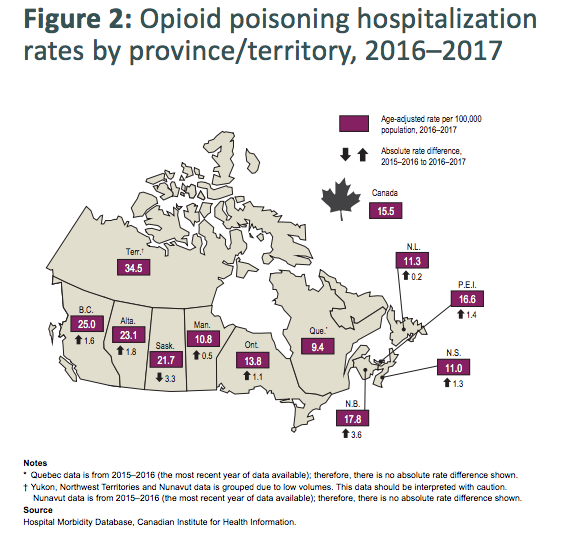 The Institute’s data, the most recent and complete picture of opioid hospitalizations, further reveals the effects of a worsening opioid crisis that has claimed more than 2,500 lives in Canada in 2016 and has prompted the federal government to pursue aggressive harm reduction methods such as permitting bulk prescription heroin imports and allowing more safe injection sites to open. The Institute’s data also show that the rate of people aged 25 to 44 years old in Ontario visiting the emergency department for opioid poisoning has increased by 85 percent over the last five years. This could all include either prescription or bootleg versions of the drug. Further, youth from 15 to 24 years old in Alberta represent one of the fastest-growing rates of emergency room visits for opioid poisoning. Both provinces were the only ones that provided emergency room data for the report. Self-inflicted harm with opioids accounted for 31 percent of the opioid poisonings reported last year. Self-inflicted harm with opioids, including suicide attempts, accounted for 31 percent of the opioid poisonings reported last year. The overall data also includes accidental overdoses. “When you look at the numbers and think of the resources required to treat all those people, I would say the impact is quite significant — and it’s growing,” states the report, which is based on hospital records from 2007 to present. In the shadow of the problem, nurses and advocates in Ontario and British Columbia have opened their own unsanctioned overdose prevention sites as a way to help curb overdose deaths by allowing people to consume any type of drug under medical supervision. The report aims to draw attention to the increasing “burden” being placed on the health care by the opioid crisis and highlight the need for ongoing national surveillance of the issue. Last year, former Health Minister Jane Philpott pledged to improve Canada’s tracking of emergency room visits and deaths linked to opioids, a process that’s often hindered by uncooperative or slow-moving provincial health departments and coroners. Michael Parkinson, a drug strategy specialist with the Waterloo Regional Crime Prevention Council, told VICE News that he appreciates the effort to monitor overdoses in real-time, but suspects that these numbers likely underestimate the reality in some jurisdictions. He said he would like to see better coordination at the provincial level and among hospitals as they grapple with the surge in overdoses. Parkinson would also like to see better quality patient care that reduces expenses and the “revolving door” at the hospitals. “People wouldn’t end up in hospitals if better prevention efforts were in place,” he said. In British Columbia, which has been under a public health emergency since last April because of skyrocketing overdoses, paramedics have responded to more than 36,000 overdose calls in the last 20 months. Firefighters and police officers across other provinces have been equipping themselves with naloxone kits in the event they need to reverse overdoses on the job. Other recent numbers show that Canada is part of a global rise in opioid-related deaths and hospitalizations. On Wednesday, England’s National Health Service said the number of patients admitted to hospital for opioid overdoses has more than doubled over the last decade, while the U.S. saw a 99 percent jump in emergency room visits from 2005 to 2014. A growing chorus of medical experts and harm reduction workers in Canada are urging the federal government to decriminalize illicit drugs as a way to help stem overdoses and promote access to treatment in the midst of an increasingly tainted street drug supply, however Prime Minister Justin Trudeau has repeatedly swatted down the idea.